Torotaku it is in boom gradually in Japan. 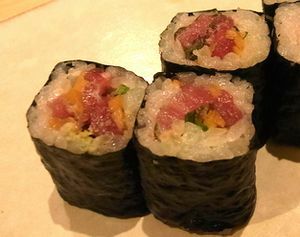 It is one of the menu of sushi in Japan, what is the recipe of this dish. The Torotaku, as the name implies, pickled radish and Toro of the material of the Japanese cuisine has been used.And, the food,’s in wrapped in seaweed and pickled radish and Negitoro to nest rice. In Japan, it is eaten in sushi shop Ginza and Nihonbashi, of Hatchobori. Pickles and a little crunchy, juicy Negitoro is very delicious with exquisite harmony. That is often pickles and raw tuna, Torotaku enclosing the large leaf. After a little research I, Torotaku is eaten Tsukiji and Akasaka, Ginza and Nihonbashi, also Hatchobori and other shops. Takuan is the pickled radish, pickled radish popular in Japan. How to Make the pickled radish is pickled radish airing the following materials. Originally pickles eat as a side dish of rice on its own. But, Torotaku eat with vinegared rice and raw fish. I think that strange taste at first, but it seems to be addicted to get used. When you’re going to a famous town sushi in Japan, then let’s try to ask the chef to Torotaku.